Sensei Quinlan began martial arts training in 1977, began teaching in 1984. Holds a 7th degree Black belt in Kempo-Jujitsu, 2nd degree Black Belt in Arnis, the Filipino art of stick and knife fighting, Honorary Black Belt in Judo, 2nd Degree Black Belt in Brazilian Jiu-Jitsu, is an instructor of Wing Chun Kung Fu, a style that has no belt ranking system. Opened the Martial Way Self-Defense Center in 1988. He has trained several successful competitors in Mixed Martial Arts, Brazilian Jiu-Jitsu, Kick-boxing, and Karate Point-Fighting. He is a certified personal trainer specializing in combat fitness training. 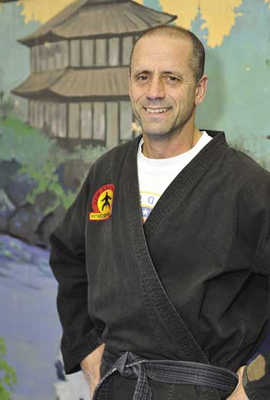 David Quinlan has dedicated his entire adult life to the study, practice, and teaching, of the Martial Arts. He created Bushintai-Do, a non-violent synthesis of various traditional martial arts skills designed for school-age children, in 2001. He developed the ThinkSafe self-defense program, as a means to teach practical self-defense strategies to those unable to commit to long-term training. The founder and head instructor at Martial Way, he still enjoys working with all ages and skill levels.